When you try to be anonymous on the web, avoiding surveillance and spying, you do everything to hide your real IP address. Usually, if your IP address is revealed, it's easy to find you. You can try TOR, The Onion Network, which was initially funded by the US Navy. But TOR isn't perfect as there are various ways to still identify someone using TOR or spy on your browsing. You can also try VPNs, the Virtual Private Networks that replace your IP address with one of their servers. But if you don't choose your VPN provider carefully and wisely, your browsing data can get handed over to the authorities through a subpoena. But now, thanks to Benjamin Caudill's new invention: ProxyHam. Benjamin Caudill, the founder of Rhino Security, has created a hardware proxy that could allow whistleblowers and dissidents to conceal better their real location. ProxyHam, which should be commercially available at a price point near $200 in the future, can be placed in a library, or another public place, connecting to the public WiFi network. Then, thanks to its 900Mhz antenna, it will be able to re-broadcast the WiFi signal of the public place over up to 2.5 miles (or just over 4 kilometers). Of course, the 900Mhz signal will be encrypted. But the choice of the 900Mhz band wasn't random: ProxyHam's signal will be made to look like those of cordless phones and general wireless home appliances that rely on that band. Thus, this camouflage will provide an additional cover to the ProxyHam, making harder to find it. The big tradeoff with ProxyHam is that to connect to it, you'll have to plug a big 900Mhz antenna in your ethernet port, as a Yagi antenna. If the ProxyHam is ever discovered, and unplugged or tampered with, a 'black box' feature will allow to record the last audio minutes of its hiding, thanks to the built-in battery. 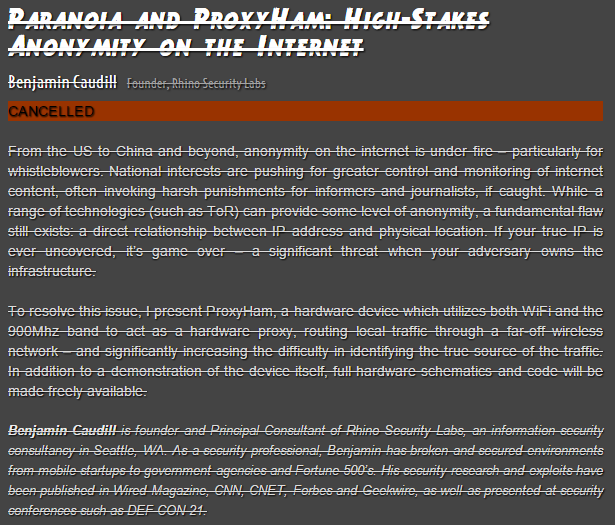 Update: As stated on DEFCON's speaker page, the presentation of the ProxyHam that was scheduled to happen in a month has been canceled.